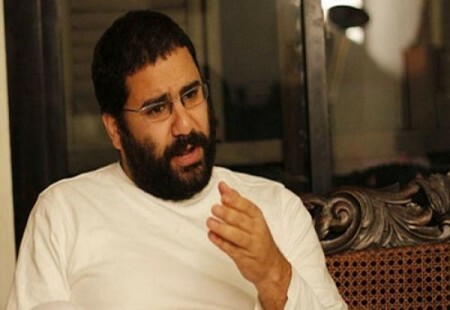 Activist Alaa Abdel Fattah, a software engineer, is serving a five-year prison sentence, in Torah Liman Prison. Abdel Fattah began serving his sentence in October 2014, after the Cairo Criminal Court ruled in February 2014, to punish him and others for five years with rigorous imprisonment, in addition to a fine of one hundred thousand pounds, and putting them under police surveillance for a period equal to the duration of the sentence, which is, in case of Abdel Fattah, another five years, for allegedly inciting demonstration. This case is identified by the media as “ the events of the Shura Council”. Abdel Fattah, is in isolation since the beginning of 2015. He’s unable to communicate with the outside world, because of severe restrictions on his rights to read, receive information and correspondence, as the prison administration refused entry of a large number of publications and books, without legal or logical justification. Also arrival of the mail was delayed for long periods, thus these correspondence loses its importance. Many of the correspondence did not reach him. In response to these severe arbitrary measures, the Association of Freedom of Thought and Expression (AFTE) raised a lawsuit in front of the administrative court in Cairo (case No. 20107 for the year 2017). The association urgently demanded to seize implementing the administrative body’s decision to refrain from allowing the scientific periodicals related to the appellant’s profession. The lawsuit referred to a number of important periodicals, needed by Abdel-Fattah, highlighting the impact of its entry on his development and career, since it is difficult for him to keep pace with technological developments, in light of the denial of reading. In the lawsuit AFTE demanded the admittance of two daily newspapers (for example: Al Shorouq and Al Youm Al Sabea) at the expense of the appellant, ordering the administrative body to deliver all correspondence regularly to the appellant, forcing it to disclose the reasons why it withholds communications, books and publications. The association based its lawsuit on a number of rules related to the law regulating prisons and internal regulations of Egyptian prisons, which gives the right of prisoners to be informed, read, and to receive correspondence. The lawsuit is also based on the constitutional provisions, which highlights the right of access to information in all ways. The petition outlined the violation of the prison administration’s decision to ban the entry of publications to Abdel Fattah, to a number of major international conventions on human rights, which clearly protects the human rights of prisoners, including the International Covenant on Civil and Political Rights, the Convention against Torture and other cruel, inhuman or degrading treatment, as well as the provisions concerning the right of a prisoner to be in contact with the outside world, which are organized by the United Nations Standard minimum rules for the treatment of prisoners (known as the Mandela rules). After the Administrative Court examined the first case hearings of Abdel Fattah lawsuit related to his right to read and correspond, on 21 February, Abdel-Fattah’s family was surprised during their visit, on February 27 that there are instructions from the Prison Service to prevent the entry of any books nonetheless textbooks for all prisoners, which are in prisons Tora sector (b). Prison officials attributed this to instructions issued after Abdel Fattah’s case. AFTE sent telegrams to the Attorney General and the Minister of Interior and head of the Prison Service sector in the February 27, 2017 to document this incident, as it is a violation of the prisoner’s right to litigation, to complain, and to address the authorities. This right is by Article 97 of the Egyptian constitution, especially that these measures are concerning Abdel-Fattah’s family for fear of the perseverance of the Ministry of Interior and the prison administration, to do things that would harm him and his safety. AFTE submitted a request to the Egyptian prosecutor on March 2nd , because It has the powers and functions under the organization of prisons and the Criminal Procedure Law and the Law of the Judicial Authority, to enter the prison and make sure the prison administration is abiding by the laws and regulations, and to communicate with prisoners to listen to their complaints .